We have some unique insights into what a typical orientation and onboarding program looks like. Over the last few years we’ve helped hundreds of customers automate their onboarding processes. Using this data we’ve put together this sample orientation and onboarding program. While onboarding programs come in all shapes and sizes to suit the needs of an organisation, this sample represents a typical process for many. Onboarding starts with a letter of offer and employment contract. Most companies have an internal approval process before an offer letter and contract is sent to a new hire. Once the new hire signs the contract the onboarding process then begins. A welcome message sets the tone for the remainder of the onboarding program and helps introduce a new hire to the company. 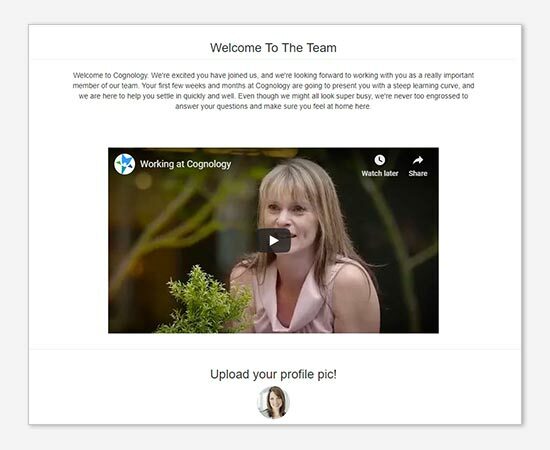 This example is a screen shot from the Cognology Onboarding Software. It shows a brief message and a welcome video. Company values are also typically included in a welcome step. Providing a person with some brief details on their team tailors the journey for your new hire. Details can include the name, role and internal contact details for the team leader and team members. Many companies assign a buddy or mentor to a person during their onboarding. During orientation and onboarding companies need to collect information about their new hire. Typical forms include personal details, tax, banking, superannuation and emergency contacts. This sample is a screenshot from the Cognology Onboarding Software showing basic personal details being collected. As part of the onboarding process many companies are now required to perform background checks on a new recruit. This can include police records checks, visa verification and other industry specific checks. To help orient your new team member, an onboarding process should provide information about the first day. This includes details on the location, what to wear and a list of activities. Companies need to train new staff on their policies for things such as computer and internet use, bullying and harassment and more. There are a number of ways this is typically done from presentations to eLearning courses that include tests. Learning a new role typically happens over some months. In the initial orientation stages organisations can help new team members become productive quicker by providing information, resources and training. Orientation programs conclude with a survey. The results of the survey inform a company where they can improve and adjust their orientation and onboarding program for future hires. See each of the steps and experience an onboarding program first-hand in our sample online site. Download our free onboarding checklist for a more comprehensive list of items you should consider for your onboarding program.